Honda Motor Co. is using lithium-ion batteries made by Toshiba Corp. in a test version of its electric car, expanding upon a supply agreement for electric scooters. Honda’s joint venture with Kyoto-based GS Yuasa Corp. will supply lithium-ion batteries for its hybrid cars, including a plug-in vehicle, while Toshiba’s packs may be more suitable for all-electric cars, which require more power, Tomohiko Kawanabe, head of Honda’s research and development division, told reporters today in Saitama prefecture, north of Tokyo. Japan’s second-largest carmaker unveiled the test versions of its electric car and plug-in hybrid today, joining Toyota Motor Corp. and Nissan Motor Co. in efforts to meet tighter government emissions rules. 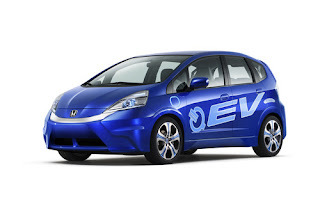 Honda has supply agreements with four battery makers, including Panasonic Corp. and its subsidiary Sanyo Electric Co., which make nickel-metal hydride packs for Honda’s current hybrid cars. Honda’s electric car can go more than 160 kilometers (100 miles) on a single charge, farther than Nissan’s Leaf electric car, Tokyo-based Honda said today. The plug-in hybrid can run 25 kilometers on battery power before the gasoline engine kicks in, about the same as Toyota’s plug-in. The figures are based on Japanese highway testing methods. The carmaker hasn’t decided whether it will use Toshiba’s batteries for mass production, Kawanabe said. Toshiba already makes lithium-ion batteries for Honda’s EV-neo electric scooter, which it started leasing to corporate customers this month. The company is also seeking to sell batteries made by Blue Energy Co., the venture with GS Yuasa, to other carmakers to help lower costs, he said. Nissan, Japan’s third-largest automaker, starts selling its lithium-ion battery-powered Leaf hatchback this month in Japan and the U.S. and will begin selling it in Europe next year. Chief Executive Officer Carlos Ghosn has estimated that electric cars may account for 10 percent of global auto sales by 2020. Toyota plans to sell a short-distance pure electric car and a plug-in hybrid by 2012.